The traditional Kanban board uses cards that tell what and how much should be produced and when it should be done. Bottlenecks and blockers are revealed, as all is visible on the Kanban board. Moving the Kanban board into Outlook gives you all in the computer. Standard Outlook Tasks has dropdowns for Project, Phase and Responsible. Automatic Synchronization. Share and store data in SharePoint site, SQL Server or Access database. Excel reports. The traditional Kanban board uses cards that tell what and how much should be produced and when it should be done. With such a visual picture of the work process managers can quickly reveal bottlenecks and blockers. Less time is spent on trying to sort out how projects are coming along, because everything is visible on the Kanban board. Moving the Kanban board into Outlook gives you everything in the computer, and no cards are lost because they fall to the floor or someone takes them away. On top of that the developers of kalmstrom.com Business Solutions have added several useful features: Drag and drop tasks between different phases of a project. Filter tasks by project and by member. Automatic synchronization of tasks within the workgroup, so everything is always up to date and everyone can see what is happening. Display of tasks for multiple projects in one Kanban board. 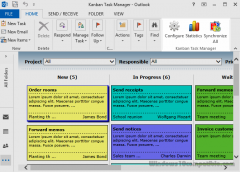 Kanban Task Manager uses as much standard Outlook features as possible, and therefore it is easy to understand and work with. The user interface is nice and colorful, and as many are already using Outlook there is no need to learn another system. 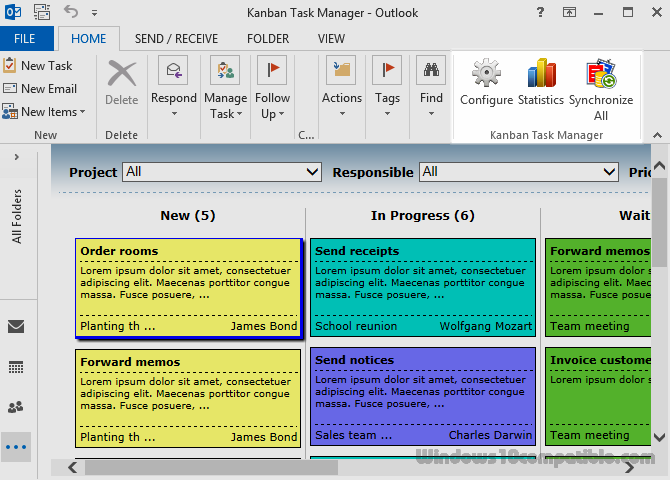 Kanban Task Manager works in an Outlook Task folder. When a user opens that folder he can reach the workgroup's different projects. The project he worked with last time will be open by default, and new projects and tasks can be created with a few simple steps. With Kanban Task Manager all ongoing projects can be seen in Outlook on all PCs, and when one member of the group creates a new task, changes a task or drags it to another phase, the other team members can see it in their PCs also. Kanban Task Manager offers three alternatives on how to make this happen: A Microsoft SharePoint site A Microsoft SQL Server database A Microsoft Access database The SharePoint and SQL Server options require that the organization has a SharePoint site or SQL Server, in-house or hosted. The Access database is created by Kanban Task Manager.